Could superglue be used to suture patients? Luke asks: Could superglue be used to suture things? James - It’s a good question Luke and the answer is yes. In fact, since about the 1970s superglue, in a much more dilute form than you’d buy in your local hardware store, has been used for just this purpose. The super glue we use in hospitals is of what we call a medical grade, so it’s checked for sterility to make sure it’s sterile and make sure there’s no bacterial viruses in there. But it works very well and head to head studies with traditional stitches have shown that the glue, in many cases, is superior because the act of actually putting a needle through the skin to introduce the suture actually is another portal for infections to get into the wound and cause wound infections. So for certain kind of incisions superglue, or it’s more dilute cousin shall we say, is very good. 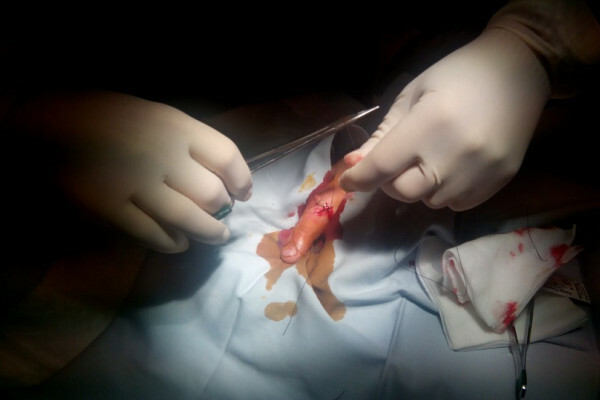 The glue is generally applied to incisions that are quite shallow, particularly on the face because you don’t then get the associated small holes where the sutures have been placed. And rather than being worried about super glue sticking there forever and it being hard to get rid of, we know that the superglue after three or four days actually comes away quite easily once the wound has begun to heal underneath it. Chris - Does it work it work it’s way out through the surface then - is that what happens, the glue is shed with dead skin? James - Exactly. As the epithelial cells die and are replaced, the layer with the glue slowly sluffs off. Chris - So you haven’t got a layer of Loctite left in your face for the rest of your life? Chris - Thank you James. Previous Would removing the seats from my car save fuel? Next Does the brain go 'offline' when scared?